Not just on EID day, but from since a month prior people gets ready and gets busy in preparation of various things related to this auspicious festival. They start shopping new clothes at famous locations like Mohammed Ali Road, Byculla and other locations. Particularly, Those white colour pathani and sherwani are seen all over the market and in bulk of work with tailors around city as soon the days arrives. Women get busy with new salwar kameez, purchasing ready made or get stitched. EID days are days of huge business in Mumbai city. As said the industry and related businesses goes to about 2o to 25 crores and ever increasing every year. Business people across Abdul rehman street and famous Mohd ali road get busy preparing for flags and banners that have name and congratulation and wishes messages for prophet’s birthday. The Flex and printing business also gets the boost during this month, Since many political parties also promote and support EID festival in Mumbai by printing huge road side banners, Although since last few years putting up banners is illegal, the business has also been affected. Almost every mosque, local around city and other famous in Mumbai like Mahim Dargah, Haji Ali Dargah are seen crowded. Green Chaddar, Lighting an Decoration in evening, Fun and Fair at various locations in Mumbai etc. People hangout with families, major muslim woman are seen in Burga (Traditional Black Outfit, Fully Covered from head to Toe with only body part seen is eyes) near haji ali dargah and other famous masjid and muslim community dominated muhallas. Males from Muslim community seems wearing white color sherwani and pathani clothes with varieties of fragrance, particularly perfumes and Ittar. People offer mass prayer (Namaz) 5 times in a day (24 hours) at home and mosques near around. With celebrations of this festival they also pray for health, wealth and prosperity with peace, happiness and harmony at home, community and neighbourhood. 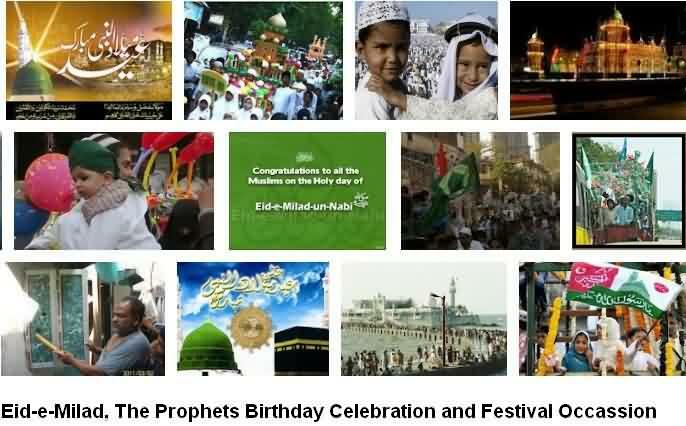 Huge Islamic Rallies (Also Called ‘Julus-e-Eid-e-Milad’) can be seen on streets of Mumbai with mostly glittering green flags in hand of people and kids too. People hug each other wishing ‘Eid-Mubarak’ to community brothers (Bhaijaan in Hindi). Visiting neighbours and relatives wearing new clothes, giving hugs (Also called ‘Gale Milna’) and wishing for prophet’s birthday is what is seen all around Mumbai and Suburban. 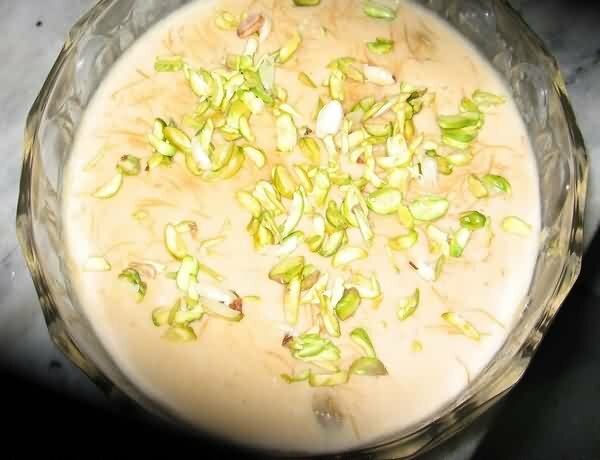 Eid Speciality has always been the special delicious dish called ‘Sheer Khurma‘ (See Picture Below).Its a semi-Liquid sweet dish made of milk with Sheer ‘Sevai’ and toppings of dry fruits inside. Previously, Crackers were seen busted on busy road of Mumbai. But now due to awareness and also positive preaching, hardly seen anywhere. Evening goes musical with, Qawali (A traditional musical program) at many famous locations of Mumbai. As part of Eid festival celebration, Free Distribution of Food items and soft drinks are seen at various street side stalls near Mosques and other Gulli (lanes) in Mumbai. Eidi (Gifts) are most awaited among teens and kids who demand it from elders and then its fun to party candies and enjoy eating outside and do shopping with that money. For Muslim community prophet’s birthday is considered a day of blessing, they believe people are blessed if people celebrated this day from their heart and distribute and donate in the name of the Prophet of Islam. Haj House : Meeting of birthday celebrations done by Muslim community. Mohammed Ali Road : Most famous location of Mumbai during EID, One can see huge crowd out shopping and eating around. More up on sale is Badges, DVD’s, Cd’s, caps, Balloons and other multi-coloured decoration stuff, Mohammed ali road is best visited during such festival seasons. Minara Masjid : The Mosque (Masjid) is been decorated specially for this festive day of Eid in Mumbai. Decorative Lightings are seen all around the tomb of masjid and in surrounding area, People enjoying the positive surroundings, spreading good wishes and blessings. Again the speciality of Minara Masjid area is the road side food stalls for delicious non veg menu. Khilafat House : Its an another location near by Byculla in south Mumbai. During this festive day one can see huge rallies moving from one street to another as part of celebration. Central Mumbai : Similar rallies are also seen in areas like Ghatkopar and Vikhroli leaded by Maulanas of the location, again singing Qawali songs and preaching positive words and poems. Jama Masjid : Also called ‘Jumma Masjid’ is another oldest and famous mosque on tourist attractions list near Abdul Rehman Street. Jama Masjid location is very crowded as surrounded by famous commercial markets.